In a moment of triumph, Alfred Hitchcock’s relevance is questioned. He responds by attempting the unexpected and foolish. Hitch had a lot of fears, and thankfully his greatest was self-doubt. It spurred him to create Psycho, which is the setting for this charming dual-focus biopic. 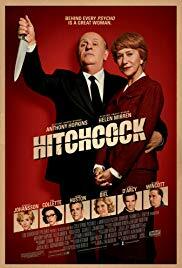 Full of wit, insights and fascinating anecdotes about the creation of Psycho, and the fiendish psyches of the masterful storyteller and his ingenious wife Alma as they battle the fears of Hollywood and each other ... like a good Hitchock film, great fun, and not what you expect. The acting is superb, and let's just save time and give the Best Actress Oscar to Helen Mirren. She deserves it purely for her mesmerising 'blonde speech'.